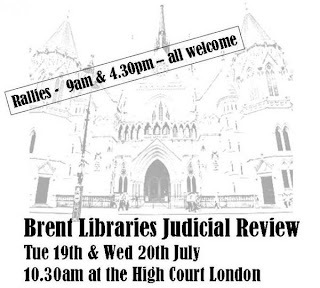 What is happening in the Brent judicial review will affect all of us. It is, quite literally, unprecedented. Although the details are different to other forthcoming reviews, it will doubtless be used as an example by barristers either way. As such, the campaigners there deserve all our support. If you can, attend. If you can’t, then say a prayer or a thought for them. It is all of our futures, whether we feel we have anything to do with libraries or not, on the line. Not least of all, those who care in Wakefield must be feeling a chill. The council there has announced it could be withdrawing funding from half its libraries. There’s another judicial review waiting in the wings right there. In other news, the Arts Council has given £70,000 for the taking of photographs of the old and new Birmingham Library as “creative responses” to them. This could easily have covered the cost of two legal challenges. Ed Vaizey Library Minister Tweet of the Day – “Today is 100th anniversary of Liver building, world’s first skyscraper”. 407 libraries (331 buildings and 76 mobiles) currently under threat or closed/left council control since 1/4/11 out of c.4612 in the UK, complete list below. Librarian professional body CILIP forecasts 600 libraries under threat (inc. 20% of English libraries). The Public Libraries News figure is obtained from counting up all reports about public libraries in the media each day. Alan Bennett and the Pet Shop Boys lead campaign against “unlawful” proposed library closures – Mail. Substantial article. “Ms Mountfield said the case was of some public importance. It was the first judicial review claim to examine the relationship between a local authority decision to close significant numbers of libraries and the duty to provide a comprehensive and efficient library service.”, “Local residents packed the courtroom after demonstrating outside the Royal Courts of Justice.”. Novelist Maggie Gee defended libraries, asking for cuts to management instead. See also Campaigners challenge Brent library closures in court – BBC. 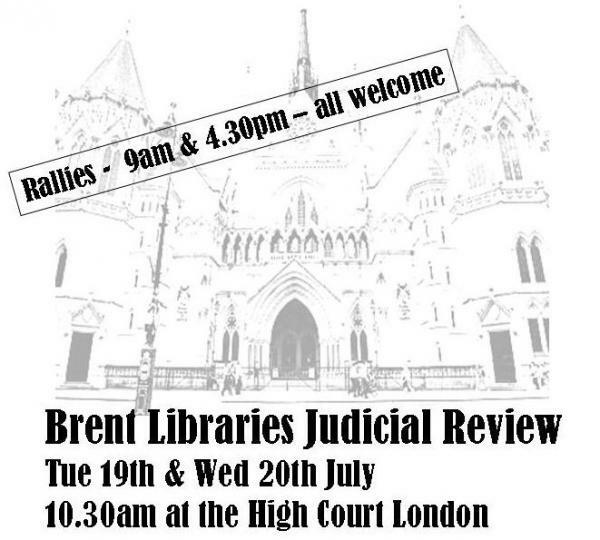 Lawyers say “”Brent sought to characterise its proposals as a ‘transformation’ of library services, but in reality it has simply swung a wrecking ball through local services with little regard to the consequences for those who use them.”. See also High Court legal bid to block library closures – Independent. “In particular, not enough was done to check on the views of nurseries and schools, some of which are dependent on local libraries to give pupils access to books.” Stars fund fight to block library cuts – Morning Star. Council defers library sites sale as High Court challenge begins – London 24. Plans to sell Tokyngton and Preston libraries postponed until August. Council hoped sales would make £1m. See also Protestors force deferral of decision to sell Preston Library – Preston Library Campaign. “Brent Council tonight dramatically withdrew proposals to dispose of half of its library properties in an eleventh-hour U-turn the night before it was due to defend its actions in the High Court.” Also: Legal bid to block library closures – Bearsden Herald. “What is the point of local authorities closing libraries when David Cameron’s Open Public Services White Paper will force them to allow private companies to tender to run them? Why not hand on an intact network? ” “librarycampaigner” comment in Independent. Arts Council England awards £70,000 to Library of Birmingham – Birmingham Mail. Arts Council gives the cost of two legal challenges to take photographs of the old and new Birmingham Library to “make creative responses”. Things do not bode well for the future of public libraries. Obsolete telephone booths recycled as libraries – Treehugger. Thor loves his library – @YourLibrary (USA). “Here is the moment as a library user where I think, “Hey, couldn’t you go to the library to send that email?” But of course I don’t expect that to happen. It’s a summer blockbuster. Do libraries go with summer blockbusters? Well, yes, as it turns out. They do!”. New blockbuster film “Thor” has character use his local public library for email and to take out a book. Durham – Minus one under threat – Barnards Castle Library safe , possibly some cuts in opening hours. North Yorkshire – Campaign group Save Great Ayton Library. Oxfordshire – Campaign group – Friends of Watlington Library. Wakefield – Plus ten under threat – 12 out of 25 threatened – Those not on list of “safe” libraries, though, are actually 13 – Ackworth, Altofts, Balne Lane, Crofton, Drury Lane, Havercroft, Kettlethorpe, Kinsley, Middlestown, Outwood, South Kirkby, Upton, Walton. Voluntary redundancies for staff. Cornwall – One Stop Shops to move into libraries – This is the West Country. “Council cabinet support member, Steve Double, said: “We recognise that libraries play a very important role at the heart of their communities. By bringing libraries and one stop shops together where possible we can ensure that we keep our libraries open in Cornwall at the same time as providing our customers with a more efficient and effective way of using the various services we offer”. Council also talking to CAB, Disability Cornwall, Volunteer Cornwall, Carrick Housing alongside police and credit unions. Isle of Wight – Library judicial review leave hearing given date – Ventnor Blog. Request for judicial review will be heard on 26th July. “VentnorBlog asked the IW council six days ago how much they had budgeted to fight the action. They still haven’t replied.”. There is also a funding appeal for the legal challenge. North Yorkshire – Deadline appeal over libraries decision – Gazette & Herald. 8 libraries have only a short time to work out how to run their service with volunteers. Lib Dems want another six months for communities to plan. North Yorkshire – Meeting to save under threat Great Ayton Library – Gazette. Great Ayton will need to be run by volunteers or it will close. Wakefield – Plans to cut cash to 12 libraries – BBC. “Councillors will consider ending financial support for the sites and instead allow community and volunteer groups to take over the running.”. “The report states: “(Libraries are) only being used at the highest levels by 8% of the people who live in the area and in some areas as few as 1% of the local population,” it said.”. Print article This entry was posted by Ian Anstice on July 19, 2011 at 10:05 pm, and is filed under Uncategorized. Follow any responses to this post through RSS 2.0. You can skip to the end and leave a response. Pinging is currently not allowed.